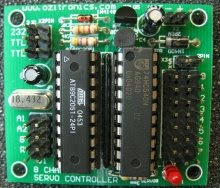 I just ordered a K1001 8 Channel Serial Servo Controller from Ozitronics (under motor control). This fully assembled and tested unit was fantastically priced at $44AUD and can control 8 servo motors using rs232. More importantly, it can use use any of its 8 output pins for digital output. 4 of these pins are to be spoken for by the h-bridge in the robot. This should give me much better motor speed control than before, and give me head-room for expansion with a servo-based arm/gripper etc.